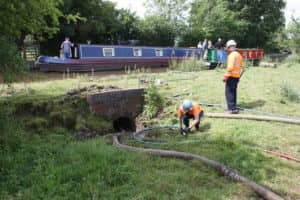 OnSite are specialists in culvert access, inspection and rehabilitation. With extensive survey and repair experience, OnSite are able to offer a complete ‘find and fix’ service in even the most inaccessible locations. 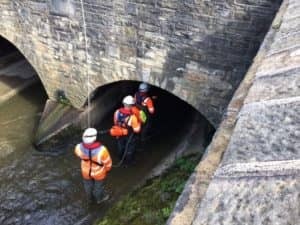 Our waterways teams are able to conduct all types of CCTV/sonar surveys using a variety of techniques (including the use of remotely operated vehicles (ROV), man-entry and via floating platform) to provide culvert maintenance. 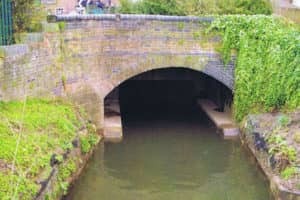 Culvert Surveys – Pre-entry scoping, man entry traversing and conventional CCTV inspections (including sonar) as well as topographical surveys. Prioritising Culvert works – Use flood mapping combined with the provided rehabilitation costs to generate the most effective budget based program. 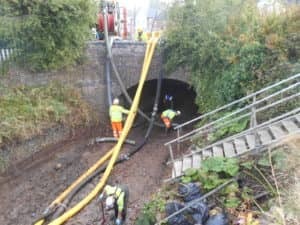 Culvert Rehabilitation – Cleaning and rehabilitation services include; de-silting, vegetation & root cutting, a full range of lining & patch repairs (including CIPP and spiral wound lining options), leak sealing, pipe jacking, structural brickwork and concrete repairs. OnSite also provides an interlinking innovation that supports all works with ecological guidance and mitigation. This tool helps both OnSite and their clients reduce their impact on the environment when undertaking essential conveyance surveys and rehabilitation works.